In 1894, the U.S. came to a standstill as millionaire George Pullman (1831-1897) faced off against railroad workers, led by Eugene Debs (1855-1926) and the American Railway Union. Commerce halted, blood was spilt and streets battles raged. The Edge of Anarchy brings this epic struggle to vivid life in a readable, accessible fashion. Pullman was a classic success story; aiding his father to elevate and move buildings along the Erie Canal. In Chicago, he gained his fortune lifting the city from the swamps. He completed his first railroad sleeping car in Bloomington for the Chicago & Alton in 1859, followed by a stint in the Colorado gold rush. Pullman didn’t waste his time picking at rocks – instead he opened a high-priced supply store and crushing mills. Returning to Chicago and sleeping cars, he completed his Pioneer sleeping car in 1865, timely for westward railroad expansion. Pullman self-publicized and built a vertically integrated enterprise, constructing and leasing his cars. South of Chicago he built his own town, including workshops, housing, schools and a library, all controlled by Pullman. While Pullman was making his fortune, Alsatian immigrants in Terre Haute, Indiana welcomed their first son. Eugene Victor Debs thrived in the small city, working as a railroad shop painter and then a locomotive fireman. His mother, fearing railroad dangers, convinced her son to become a clerk. The railroad was irresistible, so Deb joined the Brotherhood of Locomotive Firemen, soon rising to national secretary-treasurer. The 19th century railroad union brotherhoods often betrayed each other for individual craft gain. Frustrated with the brotherhoods’ internal battles, Debs formed a new, industrial union – the American Railway Union (ARU), welcoming all rail employees. In 1893 Debs scored a surprising victory for track workers over the Great Northern Railroad, attracting thousands to the ARU, including Pullman Shops workers. The nation was sinking into economic stagnation. In Pullman’s model town hours and wages were cut, but not rents. After ineffective meetings with management, the new ARU members at Pullman struck. Despite appeals for arbitration, Pullman retreated to his New Jersey summer home. The ARU gathered for its first national convention in Chicago. Debs knew the new organization was weak, but the delegates rallied to the Pullman workers’ cause, refusing to move any train carrying a Pullman car. Chicago’s railroad General Managers Association (GMA) seized this opportunity to throttle the young union. Pullman cars were added to mail trains, a pretext for ex-railroad lawyer, now U.S. Attorney General Richard Olney, to gain anti-strike injunctions and convince Democratic President Grover Cleveland to mobilize U.S. Marshals, and finally federal troops. Bloody chaos resulted. Railroad yards were easy targets for seething anger. Across the nation’s western two-thirds, the boycott became a comprehensive railroad strike, shutting down the nation’s economy. With federal troops and armed confrontations, the strike collapsed. Perhaps 30 were killed in street battles. Railroad labor activists were black-listed. Pullman re-opened his works non-union. Debs was convicted and sentenced to a six-month term. The railroads had won yet suffered politically. To avoid future chaos, Olney helped pass the Erdman Act, establishing a rail labor arbitration system to settle disputes, under which the Brotherhoods flourished. Debs’ dream of industrial unionism faltered for 40 years, until Franklin Roosevelt’s Presidency and the new Congress of Industrial Organizations (CIO) brought millions into organized labor, including Pullman workers. George Pullman died three years after the strike; his social standing besmirched, buried in a fortified grave. Eugene Debs emerged as the ultimate working-class hero, thronged by thousands as he roamed the country, running for President on the Socialist ticket. The Pullman boycott was a cataclysmic event well covered in academic volumes, yet little popular history captures the tensions between Pullman’s capitalism and workers’ struggle. Kelly does a masterful job; his portrayal not only of Debs and Pullman, but other players – from Grover Cleveland to emerging lawyer Clarence Darrow, are well written. He contextualizes the times – this was not only the Pullman confrontation, but also Coxey’s March of the Unemployed and coal field outbreaks. Kelly deserves great credit for reliably sourcing his story, as Pullman fostered many myths about himself and his railroad sleeping cars. 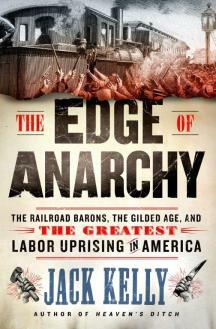 The Edge of Anarchy is masterfully written and should attract a wide audience, whether the interest is general American, railroad or labor history.